ClyA is a protein native to E. coli, Shigella flexneri, and Salmonella typhi that is capable of forming 13-mer pore complexes in a redox-independent manner. Expression of clyA in the absence of other hemolytic toxins is sufficient to induce hemolysis experimentally, and is therefore considered to be a potent cytolytic agent. Unlike a similar protein, HlyA, ClyA is not synthesized as a protoxin, which requires further posttranslational modifications to become active. ClyA is functional immediately following translation of mRNA to protein. ClyA is a 34kDa protein that is composed primarily of α-helical bundles that form a rod-shaped molecule. The membrane insertion domain is known as a β tongue and is critical for hemolytic activity. If the β tongue is mutated, the hemolytic activity of clyA is abrogated. The regulation of clyA secretion is not well characterized. To date, the method by which newly synthesized clyA is localized to the periplasm is unknown. All that is known about this process is that the secretion of clyA is not dependent on any known signal sequence, nor does it require cytolytic activity of clyA. This version of clyA is tagged at the C-terminus, the his tag has shown no attenuation of clyA cytolytic effects. The clyA gene was synthesized commercially and cloned into pDawn, a newly developed expression system that induces protein expression in response to irradiation from blue light. The pDawn-clyA construct was then transformed into E. coli. BL21 for subsequent expression. BL21 containing pDawn-clyA was cultured in blue light and the bacteria collected, lysed, and purified through a standard IMAC Ni-Agarose purification process. 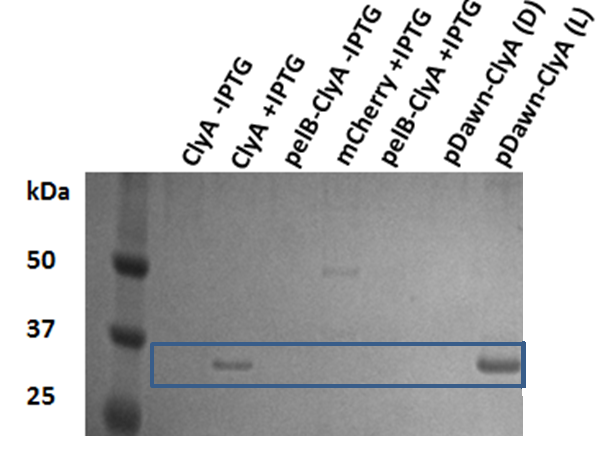 SDS-PAGE gel electrophoresis (Figure 1) shows that clyA-his (34kDa) is produced by BL21 bacteria, and that the production of clyA is not toxic to BL21. Figure 1: The production of clyA-his in BL21 in both bacteral lysate and culture medium.